War and peace / Andrew Ford. Recorded/performed at: Noordekerk, Amsterdam, on 29 Jan 05. Andrew Ford Antipoduo, Claire Edwardes, Sarah Oates 16 mins, 59 sec. 1. March -- 2. No man's land -- 3. The armed man. Score: War and peace : for violin and percussion / Andrew Ford. Score & Part: War and peace : for violin and percussion / Andrew Ford. 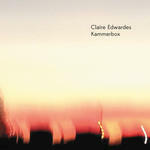 Digital Audio Album: Kammerbox / Claire Edwardes.